Growing up, the only Poker chips we were familiar with were our father's plastic chips, which he stored in a revolving wood holder. Today, a wide variety of chips are available, at an equally wide variety of costs. If having casino-quality chips is not a concern and you're willing to play with lightweight plastic Poker chips, it's easy to buy them. Head over to your nearest big box store (e.g. Wal-Mart, Kmart, Target) and see what's available. They won't cost much, and they'll last as long as you want them to. Bicycle manufacturers two sets of plastic chips that come in travel cases: the Poker Portfolio (approx. $15 to $20) includes 300 chips and 2 decks of cards; the Poker Attache (approx. $27.50 to $32.50) includes 500 chips, 2 decks of cards, and a dealer button. 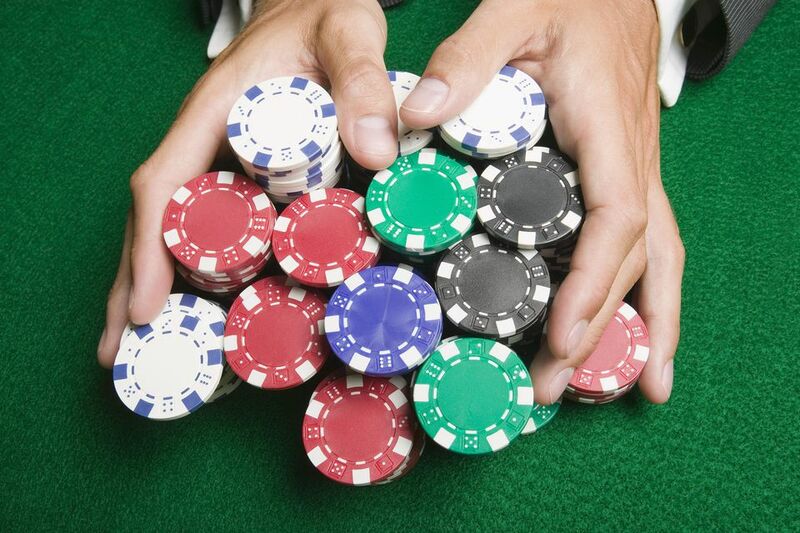 If you're interested in purchasing a set of the heavier chips used in casinos and on television shows like World Poker Tour and the World Series of Poker, you'll want to look into clay Poker chips or composite Poker chips. Heavier tends to be more desirable because the chips provide a better tactile experience and sound better when clicking against each other. How heavy is a matter of personal taste? We recommend 11.5 grams, but you should try to handle samples before making a big purchase. We don't have any experience handling 7.5-gram or 8.5-gram chips. The 9-gram chips are a marked step up from the lightweight plastic chips and are an excellent value for the occasional player. Design options are very limited, however. The 11.5-gram chips are nearly 28 percent heavier than the 9-gram and, in our experience, are available in the widest assortment of design options. The 13- and 13.5-gram chips are the heaviest We've seen available, but you'll pay a premium for that extra weight (about 13 to 17 percent heavier than 11.5-gram chips). Clay and composite chips are available in a single solid color (most often with a pattern imprinted), two colors, and three colors. We believe the two-color chips have an excellent look, and you should expect to pay considerably more for three-color chips. Of those, our personal favorite is Dice because it usually comes with thick stripes (white stripes on most chips; blue stripes on white chips) between the die sides, which creates a nice pattern on the edge of the chips. Other designs are available, and some chip manufacturers offer exclusive designs. Even if designs share a name, they might have some subtle or significant differences, so spend some time browsing at various online stores to determine which design you like the best. How Many Chips Should You Buy? The two basic options here are 300 chips or 500 chips, although sets of 1,000 chips are available—and other sized sets are available (we've seen 200, 400, 650 and 700). Also, you can almost always buy chips by the piece or in smaller sets. When considering whether to purchase a set of 400 or a set of 500, for example, be sure to do the math and determine the per-chip cost so you know which is the better deal. The good news is that if you're buying a full set of chips (300, 500 or 1,000), the price typically includes an aluminum carrying case, one or two decks of cards, five dice, and sometimes a dealer button. At online stores, a set of 300 11.5-gram composite, two-color chips goes for $75 or more, depending on the style. A similar set of 300 real clay chips will cost about $25 to $30 more. Three-color chips are more expensive, naturally. A set of 500 11.5-gram composite, two-color chips sells for $85 to $100; a set of 500 11.5-gram real clay, two-color chips sells for about $150. Remember that the final price depends in large part on the design. Certain designs can double or triple your cost. Lighter chips will be less expensive (300 9-gram composite chips can sell for as low as $40), while heavier chips cost more (300 13.5-gram chips sell for $110 and up).